Don Codleone is the kingpin cod of the vicious and racketeering mob family of the New York docks. Spin the reels through 5 reels of intimidating underwater madness and match seahorse strong men and slippery water snakes to pay your debts to the mafia lord and earn the respect of the sea with some lovely cash rewards and potentially some free spin bonuses. Click here to discover more online casino slot games. The NextGen developer team strives for original and creative game design choices and always deliver innovative products to the market. NextGen has been founded almost two decades ago and have provided extraordinary entertainment and high-quality video slots ever since. They offer a diverse list of different themed games so that anyone can find a game they like. They have become very popular amongst their audience as they provide exciting gameplay experiences. NextGen is one of the market leaders and will entertain you for hours with their engaging games. 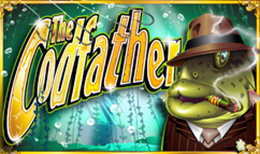 The Codfather offers a humorous gameplay experience with a mix of underwater scenes and mafia inspired fishy characters. Who would have known that in the deepest of the oceans a gang of Italian mobsters rule the fish kingdom? The aesthetics of this game are very detailed and immersive. The background scene is a mesmerizing underwater view and the reels have a shiny frame around them and a very rich ornamented logo on top. The four high value symbols are a purple worm on a hook, a fish inside a violin case, the head of a defeated seahorse and one icon containing the three big bosses of the Italian gang. You can also find the classic A, Q, K, J, and 10 as the low value symbols on the reels. See if you can find the Codfather himself on reel two, three or four as he is the wild of this game and will double the wins of any winning combination he helps to complete. He will substitute every symbol except for the scatter and if you are lucky enough to land three of him in the same spin you will trigger a bonus game. You will encounter five fishy bosses in front of you and have to pick one of them to pay you out a cash prize, if you pick right you might be payed out more than once. The Codfather logo is the scatter of this game and is extremely rewarding. Land three or more anywhere on the reels to be rewarded with free spins. During the free spins feature all your wins are tripled and you can trigger more extra spins by landing three or more scatters again. Bet a minimum of 1p or up to 40 pounds to play this game and see the fish mafia for yourself. There are 20 paylines, free spins and bonus games that will help you to land some profitable wins. And if you are a risk lover you can also activate the gamble feature after a win to double or quadruple your wins, you just have to guess right the colour or suit of the next card drawn. There is a limit of 5 right guesses. The Codfather has some very interesting characters and some very engaging features. The art style and sound effects are immersive and the gameplay experience is entertaining. The free spin feature is quite lucrative with all wins tripled and the mini game offers a nice balance to the game enriching the game feel of it. The Codfather is a nice video slot with a fun theme that will entertain you for sure. Another game is waiting for you, Try your luck and play The Great Wild.